Electronic Air Cleaner Repair & Diagnosis On Your Air Cleaner Power Supply. Labor only to test & repair your electronic air cleaner power supply. We are the only company in the country to offer electronic air cleaner repair & testing service for both consumers and contractors alike. We perform this service on all Honeywell electronic air cleaners. Mother boards can NOT be repaired since the individual components on the boards are NO LONGER available. We are however, able to determine IF the mother board is bad and sell you a replacement mother board if needed. 2. 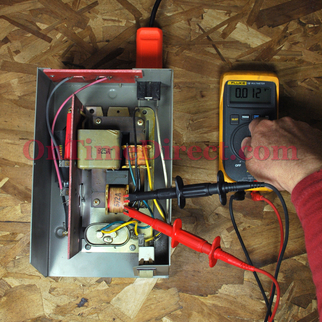 Remove the Power Supply Assembly from the Air Cleaner (FOR FURNACE MOUNTED AIR CLEANERS IT IS THE METAL BOX THAT IS BOLTED TO THE TOP OF THE AIR CLEANER CABINET). 3. Ship us your entire Power Supply using UPS or FedEx. This way you can track your shipment and have proof of receipt/delivery. The worst problem was finding a box for it. After "slicing and dicing", I got it done. They called me a day or two after they got it and said I needed a new power supply. I agreed with the price and a few days later, it was back home. I put it into the Honeywell, installed the cells and voila! It works again and I can definitely feel a difference in the air quality! Thank you, On Time Direct! Exact fit. Works fine. I liked being able to send it to you for diagnosis. Your prompt reply was appreciated. My power supply was repaired and returned the same day it arrived. Amazing. On time with great service over the phone, works perfect! Thank you. Good website, available for phone dialog. Easy to use on-line instructions and tips to do diagnoses/test. After I adjusted my mind set to send off an appliance for repair, I realized it's a good business model since the unit would be declared end of life by your local furnace repair shop and OTD does as a specialty all the time. OTD tested and determined what to replace and sent back the same week for a fraction of full replacement cost. Perhaps I'll get another 25 years of service from this E air cleaner. Electronic air cleaner works good as new. Good job fixing it. Thank you. Trouble shooting video presentation was the best, not handy the step by step approach on what could be wrong with the unit was great. I sent a 15 year old failed air cleaner power supply for diagnosis. I was very impressed with the prompt service and very clear and timely communication that I received via email. I was a bit disappointed with the parts cost to repair my power supply. As with most things now days "repair" seems to mean "replace". I suppose finding out which component on the circuit board is bad, finding and installed a replacement and assuring proper performance is more expensive than just installing a new board. In any case; I got very timely response and excellent communication. I am satisfied and the power supply is operating properly so far. After my Electronic Air Cleaner/Power Supply was diagnosed and repaired it was shipped back quickly, and works perfectly. I would use them again without a doubt. Very good transaction, thanks for the fast service. Air cleaner quit working after installation of new furnace. Furnace installers could not fix the air cleaner. Sent in power supply for service and found it had a bad mother board. When I received the unit back the air cleaner still wasn't working. Jay promptly returned my call and helped me further diagnose my cleaner over the phone. My unit is now working like new. This company saved me 1800.00 over the cost of a replacement unit. They offer an unique service and are highly professional. I would recommend their service to anyone with an air cleaner problem. these guys were awesome. I am just a lowly homeowner with a non-functioning Electronic Air Cleaner. I had replaced various components - including wires on my collector cells - all in an attempt to get my unit working. And nothing worked. Pulled the head unit in, sent it to these guys, and they shipped it back. BOOM! I have a working unit now for the first time in several years. YAY! Thanks guys!!!!! Very happy with the results. My Honeywell air cleaner hasn't worked in over a year. After doing some research "On Time Direct" was one of the few if not the only company that was the answer to my problem. The diagnostic service found the problem and my air cleaner was fixed and sent back in a reasonable amount of time. Excellent service, very happy, would use again. Only thing negative was the packing, BOX WAS OPEN, 1 pc of tape wasnt enough. box to big, not enough air packets, lucky it even got to me in one piece. Our 18 year old Honeywell F50f electronic air cleaner stopped working during one of the worst months of air pollution in recorded history here in Salt Lake City. We sent the power control module in for diagnoses and it was working fine. Over the phone, the fine gentleman (the one that's in the video) had me shake the filter cells side to side and it was quickly determined that one cell had two collapsed plates. This causes a dead short that is recognized by the control module which shuts the system down for self preservation. Got the control module and replacement cell back in two days and WE'RE BACK IN THE CLEAN AIR! Thank you for the great service, knowledgeable over the phone diagnosis and quick turn around. We love our electronic air cleaner and appreciate the sanctuary it creates in our home, living in the city with the worst air in the nation three month a year. Honeywell air cleaner services, communication, and turnaround time were all exactly as promised. The power supply unit on my Honeywell Electronic Air Filter (20 years old) went bad and needed to be repaired. After working through an extensive diagnostic procedure myself, on the phone with the courteous help of On-Line Direct technician Brian, we determined that it wasn't anything I could fix myself. Hence, I removed the power supply unit, packaged it up and mailed it to On-Line Direct for further diagnostics. Within a few days, I received an e-mail, identifying the problems and the cost of repair, which I approved. Within another week, I received the power supply unit back, repaired and ready to install - which I accomplished in a matter of 15 minutes. The air filter system has worked flawlessly since then. Before sending the power supply to On-Line Direct for repair, I had placed calls to a number of HVAC repair companies in my area and got essentially the same response; they would send a technician over to my house for a fee to make a diagnoses; the "ball park" cost that a couple of them provided over the phone ranged from $500 for repair, up to $1200 to replace the power supply unit completely. The total cost of repair, including shipping the power supply unit via UPS, with On-Line Direct was just over $200 and took no more than one (1) hour of my time total. This company is at the top of my "favorites list", as far as HVAC parts and service. We were VERY happy with the service. It was uneventful, just like it should be. They contacted us quickly via email to tell us the problem and the amount and it was fixed and returned very promptly. No worries here, you get exactly what you are paying for. Thanks to On Time Direct for such great service. The price was a little higher then what I was hopeing for but the turn-over time was very good. The part also is working flawless so I do not have any reason to complain. I ordered the Diagnostic Service for the power supply component of my Honeywell F300A-2020 electronic air filter and its subsequent repair. After several months of no yellow LED when the fan was running and no significant 'dirt' on the filter elements, I decided to search for replacement and repair services via the internet. I came across ON-TIME DIRECT and their excellent video describing a preliminary user diagnostic procedure. Based on the thoroughness of the video and its excellent presentation, I did the tests described and decided that, yes, my power supply needed professional investigation. I called ON-TIME DIRECT, asked my questions and decided these guys knew what they were talking about, and removed my power supply unit and sent it in for service. Shortly afterwards I received an email describing what they found and the need for a new power supply board. I approved the repair and got it back about two weeks later. It's fixed and the filter is now working properly. This service did what they said it would and I have no hesitation or reservations in recommending ON-TIME DIRECT. I saved about half the cost of the least expensive replacement unit on the web and now have a fully-functional air cleaner. Good work guys! Excellent service - customer service representative explained the repair process and cost. I am very satisfied with diagnosis and repair work. The diagnoses was quick and the repoair was done quickly and the unit returned to service within two days excluding shipping (two weeks by ground). I am very happy with on time direct as this is the second time I have used them. After reviewing the web site and following the instructions, I felt that my collectors were in ok shape. The power supply was over 20 years old and suspect. I took a leap of faith and hoped that the power supply repair would get my electronic air cleaner going. I sent the unit in and it was returned in a very timely manner repaired. Well, I am happy to report that after receiving the power supply I installed it into the air cleaner and fired it up...SUCCESS! Thanks to On Time Direct, I saved a bundle versus replacing the unit with a new electronic air cleaner. The only reason I took the initiative to remove the power supply and send it to Honeywell Repair Parts is because of the very well done troubleshooting video on their website that provides step-by-step instrucitions on how to remove the power supply and ship it back for a bench test and subsequent repairs. The entire turnaround time was a little longer that I would have liked - about 2 weeks - but now that it's back and reinstalled, the system is back in operation. I suspect it would have cost me several hundred dollars to have an HVAC technician service the system, so for a fraction of the cost, the repair was made and I'm back in business! Sent them my power unit for examination and repair. They we quick with the check up and repairs made promptly. Thanks. the PS1201C01 used on older sale switch systems do use the AFS plug on the board and to get the unit to power up you must shut the J3 (two left side posts as marked "by pass AFS"). Bypass the Air Flow Sensor The earlier F50A, F50 and F50E used to be wired direct to the blower. This allowed the power supply to turn on when supplied with 120V from the blower. Now the new Honeywell power supply comes with the option to add an AFS (air flow sensor). If your unit DOES NOT have an AFS and you have the new power supply, such as the PS1201C01 and PS1202C00, the AFS must be bypassed for the power supply to turn on. To bypass the AFS you simply connect the two pins marked' bypass AFS" on J3 (see photo below) situated on the bottom left of the power supply. Turn around time and repair costs were well worth the time taken vs total replacement of the entire power supply module, which would have cost nearly twice as much. Thanks for the great service. I installed the electronic module and then powered up the HVAC system. The filter "On" indicator light flashed on then went out. Turning the power on and off didn't help. Later I cleaned and dried the filter panels (and copper contacts) then reinstalled the filters. After turning on the HVAC power, the "On" indicator lit up and stayed on. The unit seems to be operating well. Appreciated the Service Department's care in garnering the background information prior to diagnosis and repair as well as follow up and recommendation addressing the potential issues. service was excellent. As advertized, a quick diagnostic and notification of needed repair. Reasonable cost and quick turnaround. Unit is working, but power light flickers. Don't know if that is good or bad. Will have to call and find out. I was pleased and impressed with your service: clear and easy website, quick reply and evaluation of power supply, terrific tech support, and almost overnight delivery of a new unit. Our regular furnace company wanted over $700 plus installation for a new power supply which was outrageous. A quick internet search brought me to your site and the rest was magic - with a few questions to Tech Support, I installed the product and it runs perfectly. And I saved 60%. I highly recommend your products and service. Great communications quick troubleshooting and fast turnaround, my unit was not repairable but contact was prompt and a new unit was shipped with credit for the troubleshooting charge against the new unit. Great Job! The local dealer wanted to sell me a new power supply, which I estimate would cost $600+. The all-in cost of the repaird supply via Honeywell Parts was less than $250. I'm feeling pretty smart right now. Terriific service. Easy way to diagnose and fix a problem that would cost more if done by a service technician. Great service, works great. Easy procedure for diagnosis and repair. Very happy and surprised with the speed and convenience of having the repair to my electronic air cleaner done by your staff It was done and sent back 1 day early and being the Christmas mail rush I thought it would take much longer. It was back Dec 24th Christmas eve day and I installed it shortlly after. Working great, I really missed it when it stopped working during the summer. Thanks for the great service!! Assembly went OK and operation worked great. Repair flow chart included with air cleaner was faulty. Service providers kept telling me the unit was working because the indicator light was on. I sent the power supply in for diaonostic service and they confirmed that the circuit board was faulty. Problem solved. F50e unit works fine now. Suggest that honeywell show dealers how to trouble shoot their product so home owner doesnt have to.. Thanks Honeywell. I was quoted $375 to repair my electronic air cleaner controller by a local HVAC service provider. You repaired it for about 60% of that. When I got the unit back it didn't work. I noticed that what appeared to be a pressure hose was not connected. I connected it and it works great. Thanks for providing a service like this. I recently sent the power supply unit of my Honeywell Electronic Air Cleaner to the Phoenix Honeywell repair facility. The subject air cleaner had recently failed and I called the local "authorized" Honeywell dealer for service. To make a long story short,"he had no idea how to repair the unit". He did,however,offer to repalce the unit with a new one at the tune of $850. I elected to contact Honeywell via the internet and purchased the diagnostic service. I sent the power supply unit to Honeywell, four days later got a call from a Honeywell technician advising that the mother board on the unit needs to be replaced. I gave the OK to do so and got the power supply back in four days. Bottom line is, "this is the most efficient, fastest and honest repair service I ever experienced". The unit now operates as it did when it was new. I rate the Phoenix repair facility a "10 out of 10". Great service. Quick, responsive and reasonable price. I shipped a power supply to them for repair and they diagnosed it and said it needed no repair. I appreciated their fair, honest response and quick service. I received the repaired part and immediately installed the power unit back into air cleaner. Nothing happened! I checked all electrical connections and outlets. I check your web site a realized that the heater/air conditioner had to be running for the unit to function properly...and it does. Thanks for a great service and info through your web site. Also , when I placed this order the people there were pleasant, knowledgeable and very helpful. My Heating/AC company wanted $ 970.00 for changing the power head on this electrostatic filter. They refused to itemize such proposal, and upon research I learned that the cost of a new power unit is about $ 370.00. So they wanted $ 600.00 for labor (removing 2 screws, and replacing this unit with a new one: 5 minutes of labor or less). I then engaged the Honeywell service, learned that the power unit did not need replacement, and had the unit serviced through a convenient, reasonable and fast process. Difficulties: 1) shipping this unit is problematic and quite expensive, due to the odd shape that requires an unusual box and triggers significant overcharges; 2) reading people's comments, it seems that there is a good number of mother board failures, and the Honeywell technician could not explain what causes such failure. In any event, the overal experience was quite smooth, and definitely less expensive than the proposed service from my AC company. Since these are very good filters, I recommend servicing them regularly (cleaning of the cells and prefilter screens at least every 6 months), and contacting Honeywell before embarking in expensive service or part replacements. In looking for a replacement for my non-working electronic air cleaner attached to my furnace, I came across your web site with an offer to diagnose the problem for a great price. I took advantage of it then shipped my unit to you for diagnosis and repairs. The whole process took about 10 days. The whole process was so easy because I didn't have to call in an expensive service man to get the unit repaired. I am sure I saved hundreds of dollars by using you. I am thrilled that I found you. very satisfied with the prompt service. No problems. I give Jay 10 stars for customer service. A great web site design that allows a homeowner to diagnose and fix a problem themselves. Great service! Thank you very much for the quick service and for answering questions. I was waiting a few days to see the results . So far so good . Will use your service again . Thanks again . We were very pleased with the outcome. The company that maintains our furnance wanted to charge us $700 for a new control box for our air cleaner which was not in our budget. The representative from Honeywell's 800# told us about this repair option so we gave it a try. Honeywell found only minor problems with the controller and therefore saved us hundreds of dollars. The unit was shipped back to us very quickly and is now working perfectly. I have already recommended this solution to a co-worker. Easy, fast and efficient. My EAC power supply was replaced and back to me in a very short time. The service department also included a replacement ionizer wire in the package at my request. I am very pleased with the response time and quality of workmanship. The EAC is now back and operating in my forced air heating system. I received my Power Supply, well packaged and in good shape. I have installed it in my electronic filter and it seems to work just fine. It has bee installed for 3 days now----I will rate the repaired part at some time after it has been in use for a while. My air cleaner was about 30 years old, and i was not certain it could be fixed. But after I ordered the Honeywell Electronic Air Cleaner Repair & Service, I received the call from Honeywell, and the technical dept. was great, and guided me step by step, and I was able to ordered all the necessary replacement parts. After I received all the parts, I again called the technical dept. for help and received enough tips and knowledge, then i was able to installed all the parts. Now my 30 years old Electronic Air Cleaner is working just like new again.